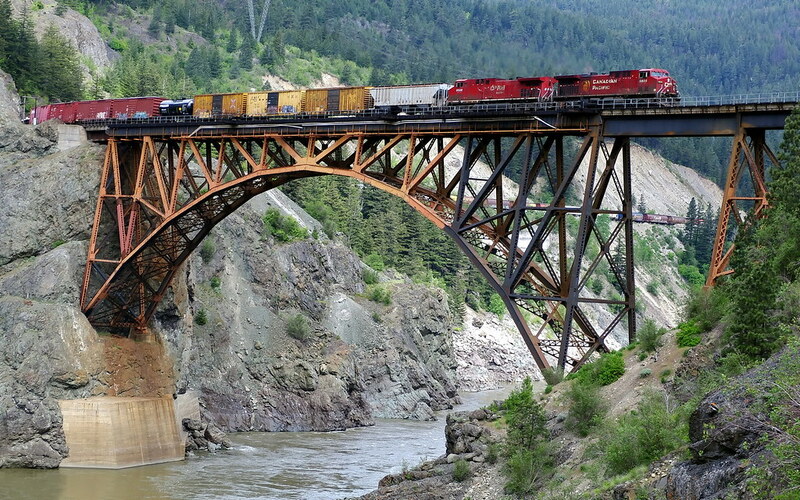 Here are some rail photos from road-side on Hwy-1, just north of Gold Pan Provincial Park, along the Thompson River. - you can see the CP line, just below my position. It has just crossed under the highway, to the left of where I am. 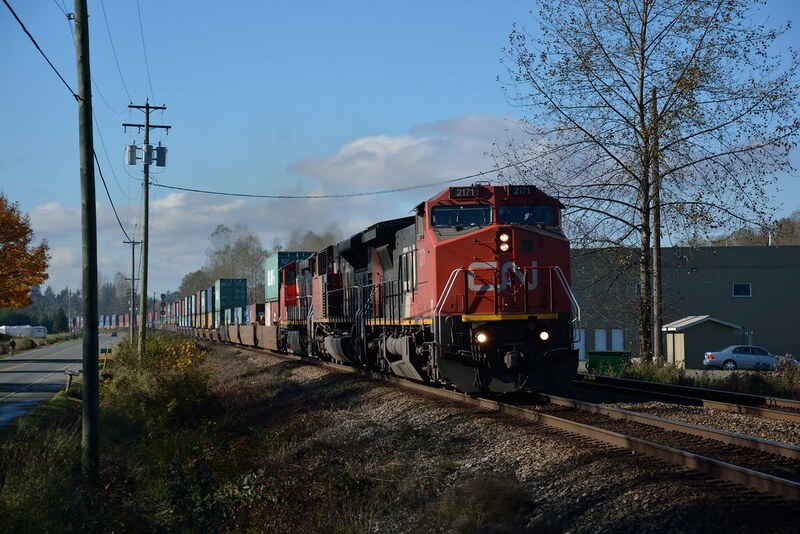 And some photos of a CN freight on the CP track. The old station name for this area is Drynoch. On the east side of the highway, almost ready to cross under the highway. - the CP track (near side) is far less dramatic here, than the CN line on the opposite side of the river. That's typical of this Fraser/Thompson corridor, where latecomer CN had to do dramatic engineering to make its line work on the opposite side of CP's Onderdonk line. Some brief photos taken at Barnet Marine Park, located in Burnaby, on October 15th. 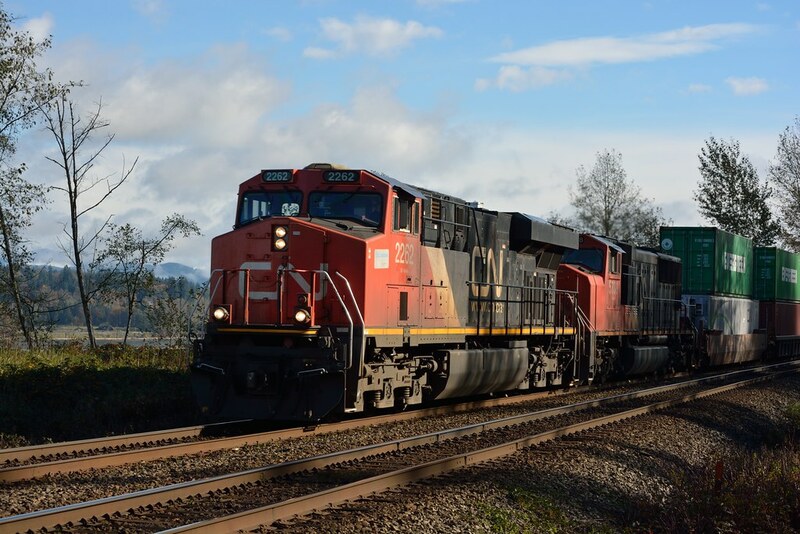 This was a yard switcher heading to Port Coquitlam, just ahead of the 16:50 West Coast Express. 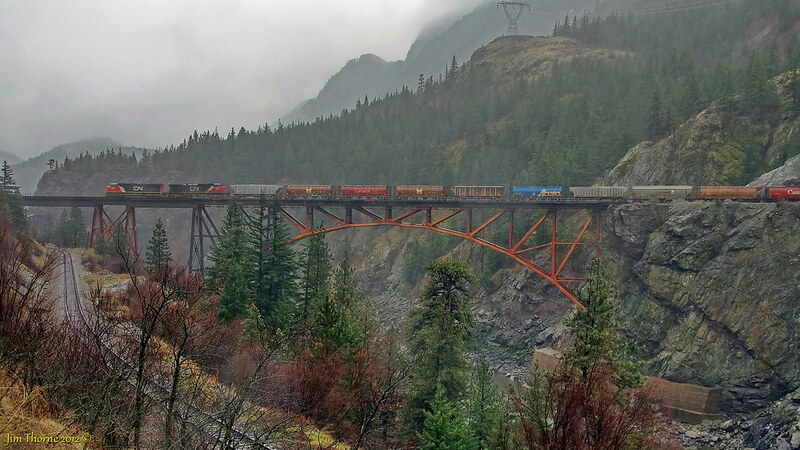 Cisco Bridges, just south of Lytton, BC, on the Fraser River. The scene, of the CP bridge (foreground) and CN bridge. The CN track is just below my location. That CN train is still on the CN bridge. My location, atop a road-side berm. 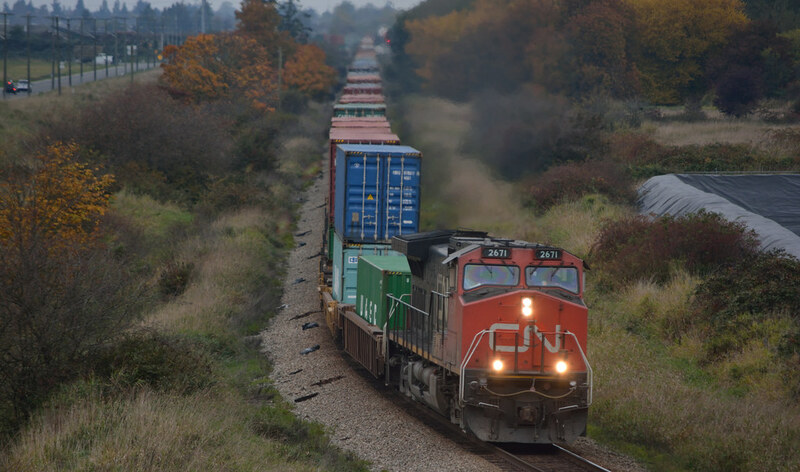 I was in Delta today and happened to see a train was departing Roberts Bank, so I found a overpass nearby and got a photo. 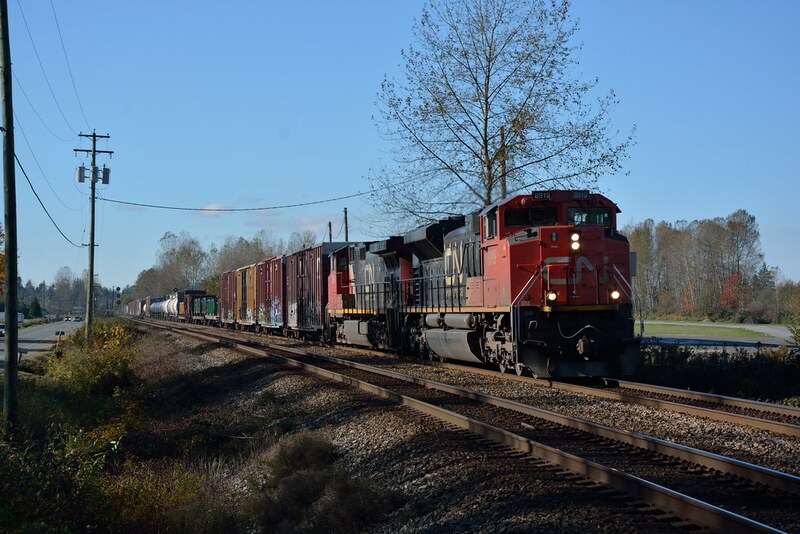 Today was a busy day on CN's Yale Subdivision near Fort Langley. Mike, it would be nice if you would provide some location information when you post photos such as these. 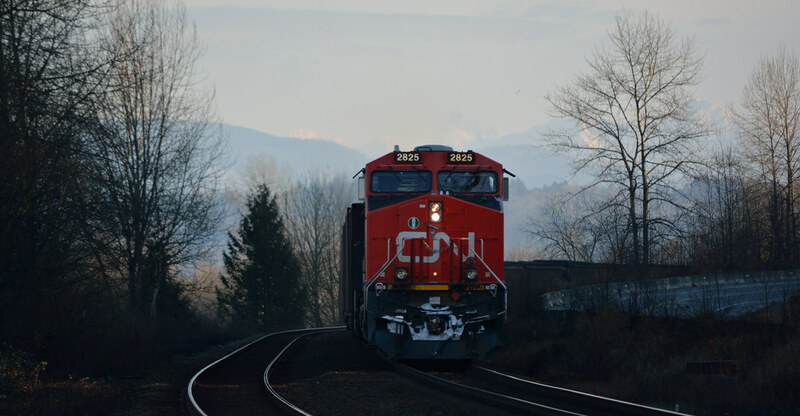 'CN mainline' means somewhere in North America on CN's vast system. I assume that in reality we are talking about somewhere close to Vancouver or in the Fraser Valley. 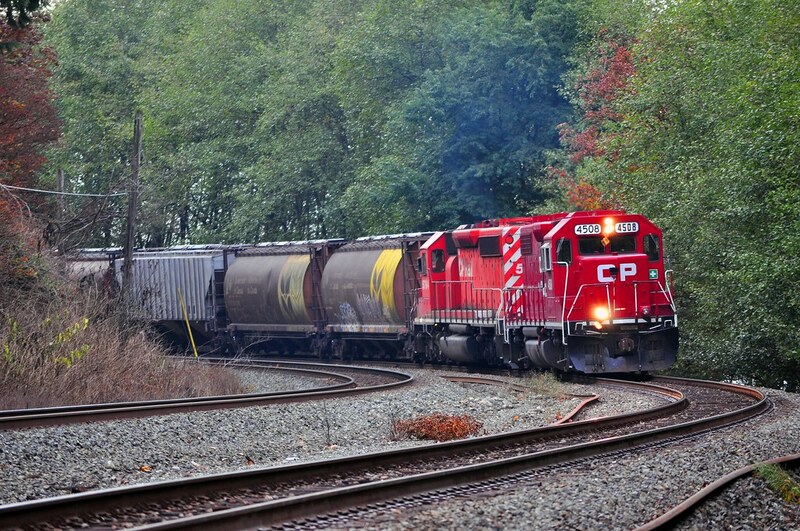 Also, CN trains sometimes are moving on CP's tracks so I'd like to know if that is the case too! PS: They are nice pics. A few more views from my morning at Cisco bridges. - morning of September 12, 2013. 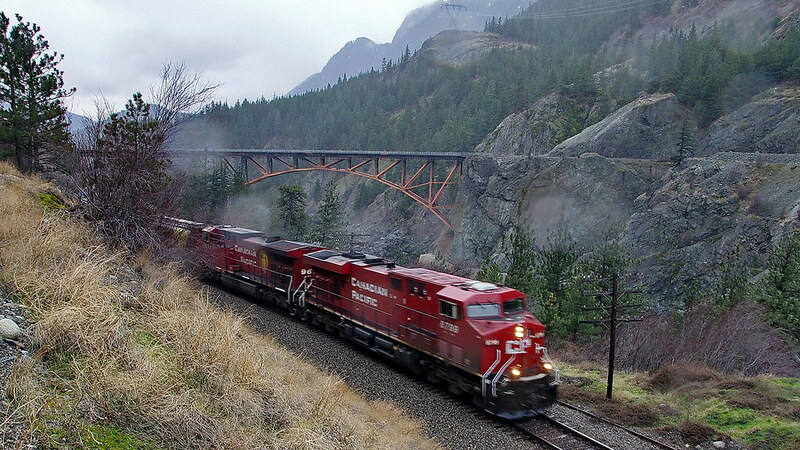 I like the CP line in this photo, because it appears so straight, compared to the tight curves on the CN line with its bridge. Straight through the rock tunnel and then immediately straight across the bridge. - the privilege of being first in this canyon. 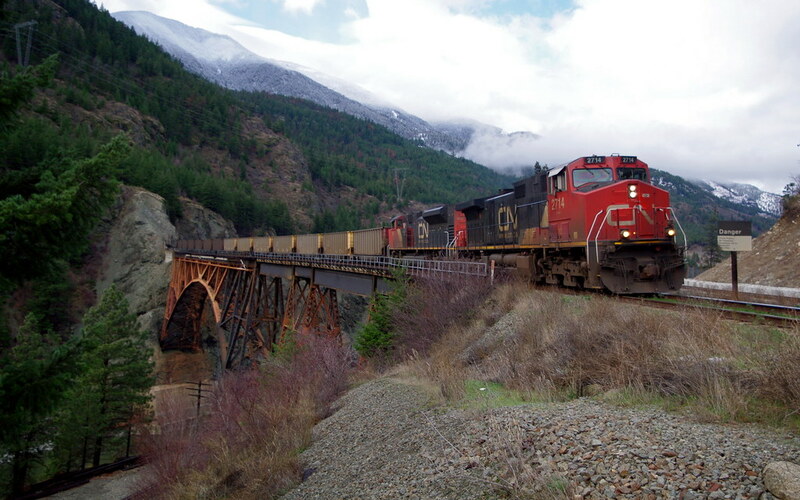 ...but the CP line is not perfectly straight, because there's a curve where it passes under the CN bridge, as seen by the double-stack cars in this photo. 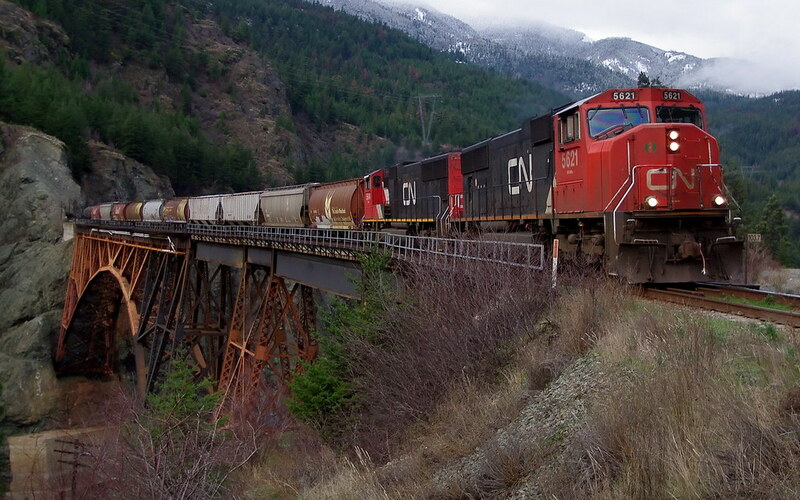 A CP train on the CP bridge. 2 different roadside locations along Hwy-1 & the Thompson River. - TransCanada Highway #1 is on the far left of the photo. South of Martel is this south (west) bound train on the CN track. 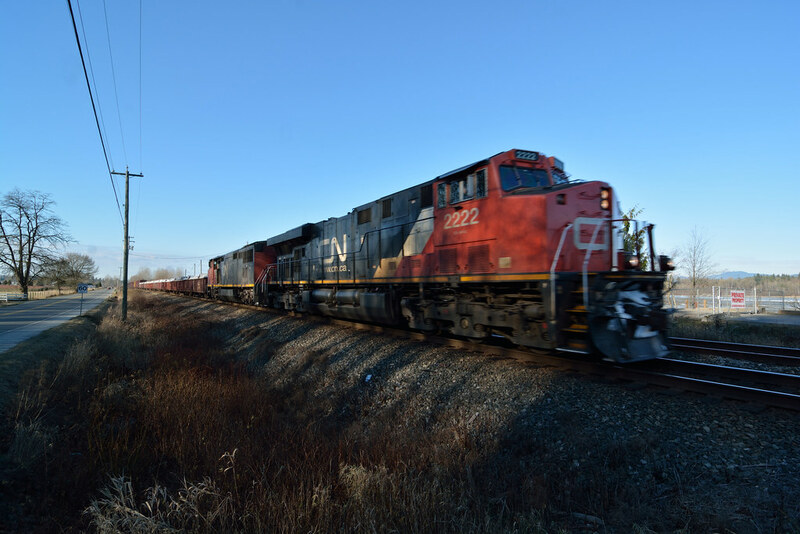 A couple of train passings on the CN track, near Martel. - this is between Spences Bridge & Ashcroft, off of Hwy-1 along the Thompson River. Both of these photo sets are of head-end and then tail-end. 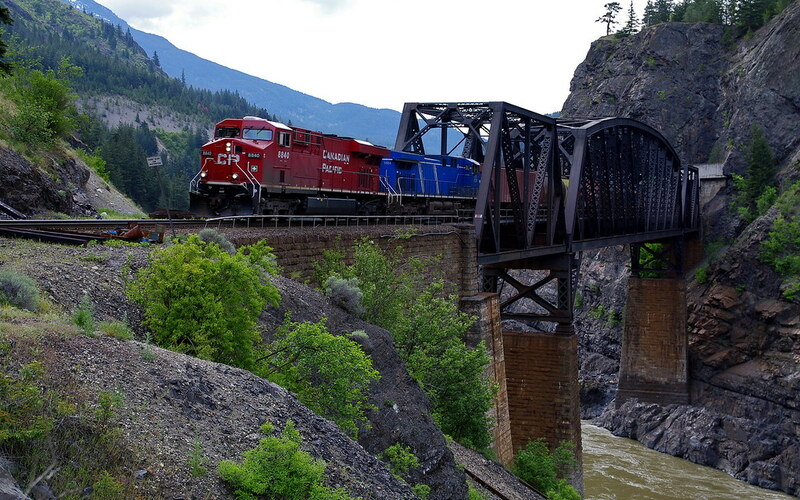 And a westbound CP freight, with an unusual (to me) blue locomotive at the head-end. A couple of interesting things at Martel, along the Thompson River. The CN track below me has the end-of-track sign. - this is for a short, likely unused siding. The CP track across the river has the interesting optical-illusion where the track around the bend looks much higher in elevation than the track on this side of the hill. 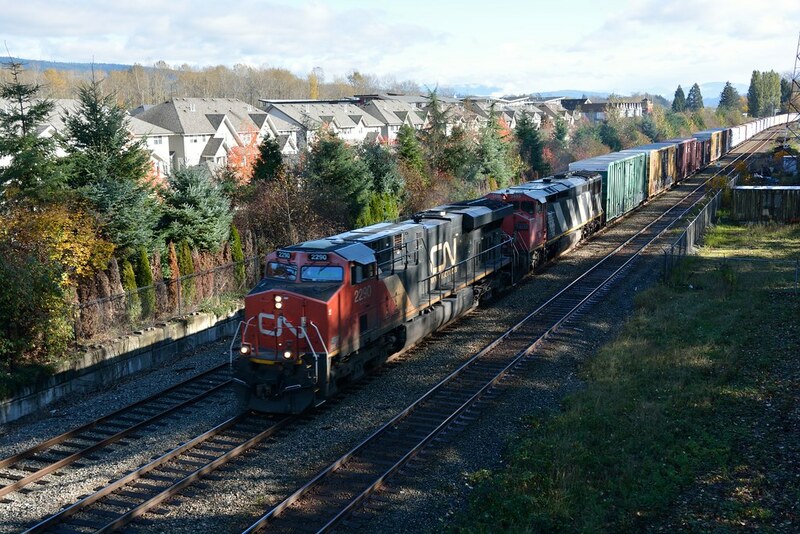 ... a westbound CP freight, with an unusual (to me) blue locomotive at the head-end. 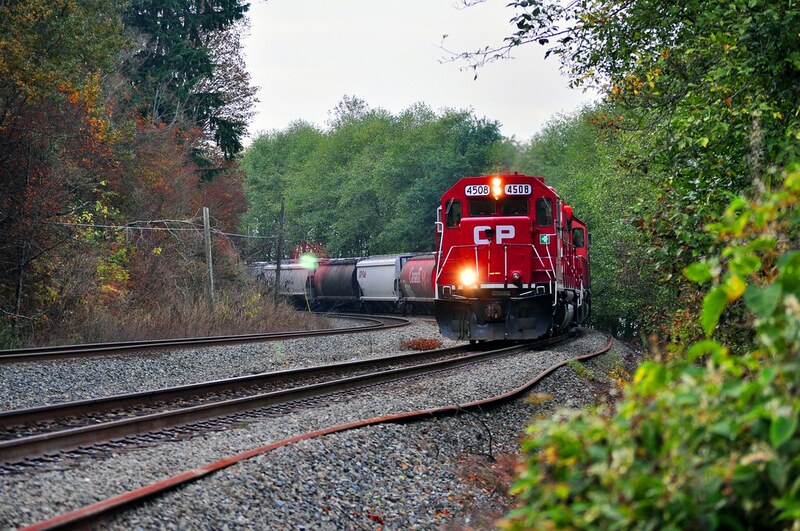 That unusual blue locomotive is one of many leased units that CP has on their roster. I would guess that perhaps 20% of their mainline locomotive fleet is made up with these leased units. 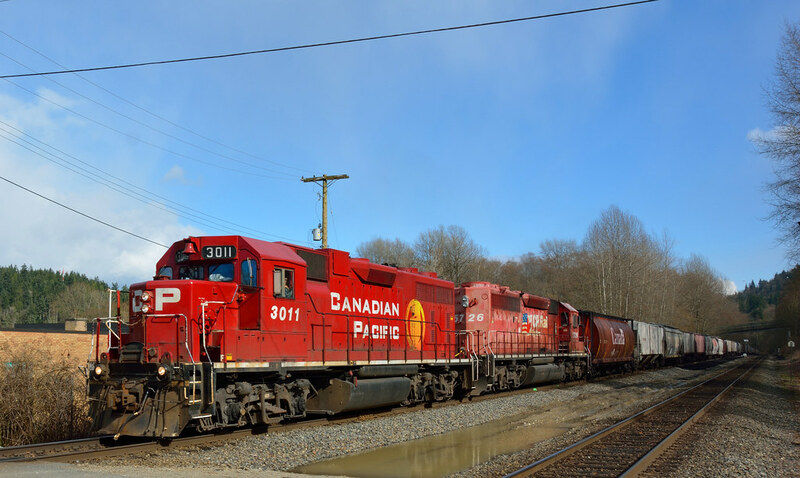 CP must have determined that this arrangement for a portion of their fleet is the lower cost way to go. 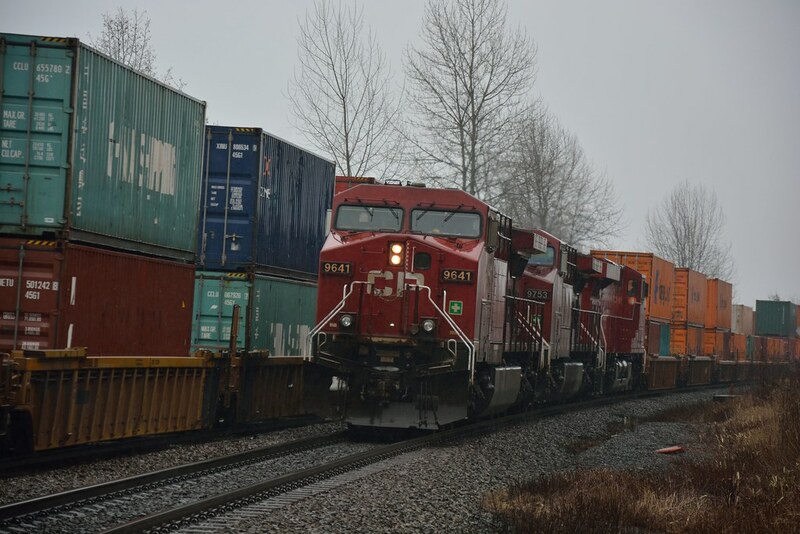 When placed on the head-end of a train, however, it looks as though you have a train moving here that is neither CN's or CP's. CEFX #1001-1025 were delivered late 2001. CEFX #1026-1059 were delivered between October and December 2004. All units are on long term lease from CIT Capital Finance (CEFX). Units #1001-1025 are painted blue and white, with grey fueltank, and grey trucks. Units #1026-1059 also painted blue and white, but with black frame, fueltank and trucks. Units CEFX #1001-1025 (Built to Union Pacific specifications) have high mounted numberboards above the cab windows, a white dome type antenna, and don't have portholes in the cab doors, while CEFX #1026-1059 (built to CP specifications) all have low nose-mounted numberboards, standard antennas, and portholes in the cab doors. CEFX #1001-1025 off lease as of July 1, 2006, leased out to the BNSF. CEFX 1002, 1006-1007, 1014, 1018-1020, and 1023-1024 are owned by SOO as of February 28, 2011. I think what you see here is a bit of what is left of the Martel siding. 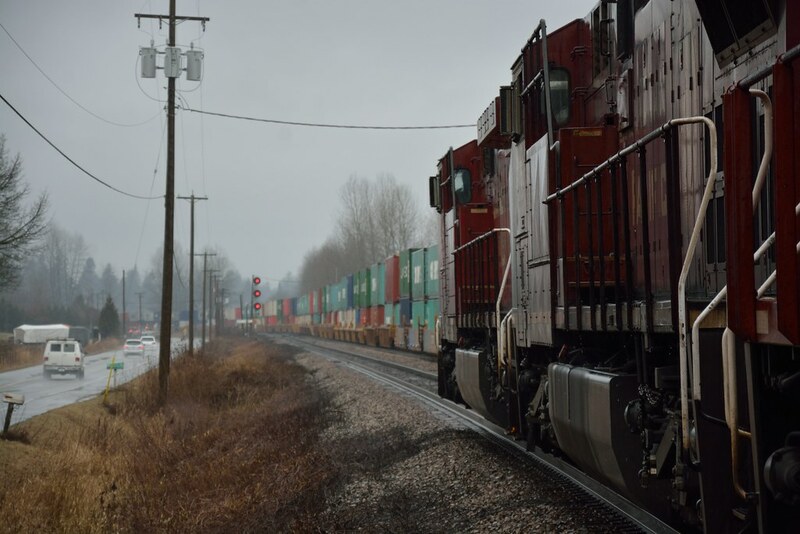 This was a signalled passing siding. The signals still remain in use today, but the siding is long gone. I suspect that with directional running in this area there was little need to keep this siding, and because it was shorter (6300 feet) CN chose this one for removal. 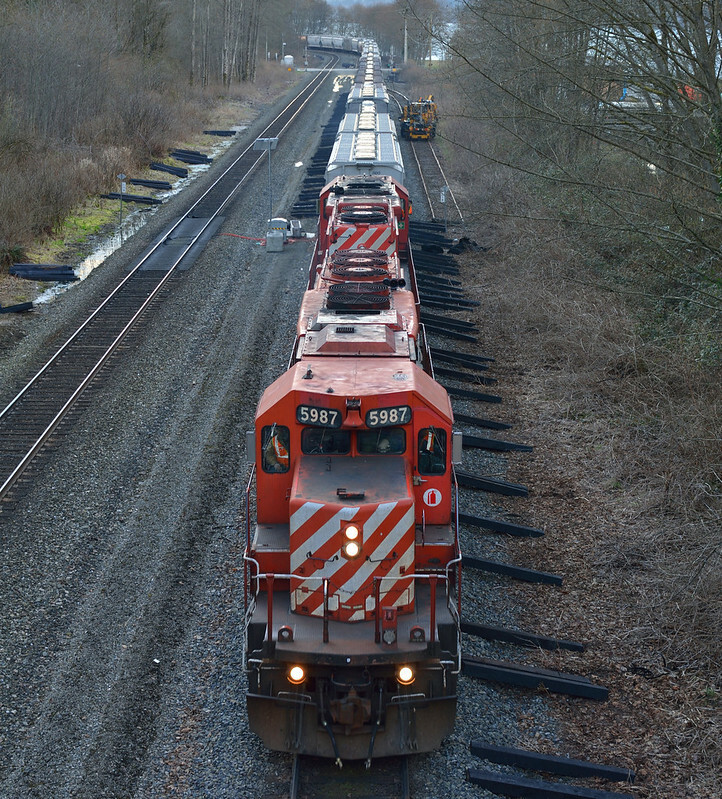 Occasionally trains run 'ACOT'* on both CN's & CP's tracks, so there is a need to keep some sidings operational. They also allow trains moving in the same direction to overtake one another. 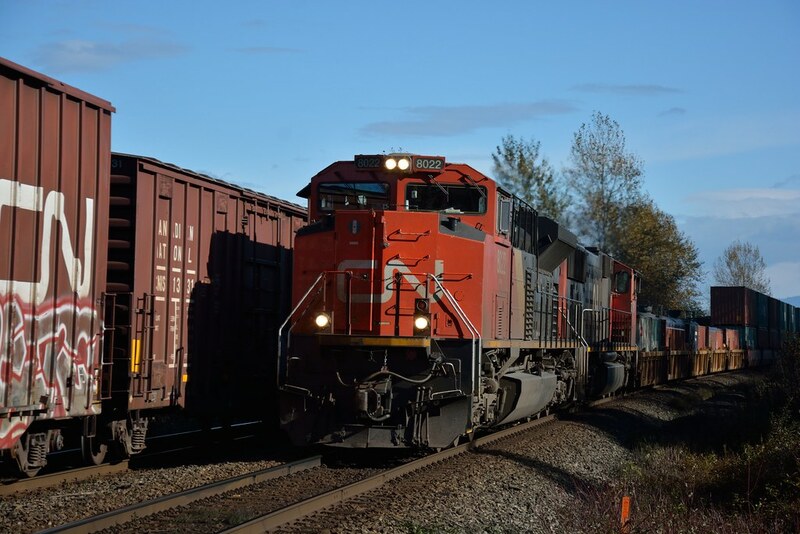 As trains now are often two or even three km in length, sidings need to be long enough to permit such trains to pass one another. Was back at my favourite spot along CN's Yale Sub. 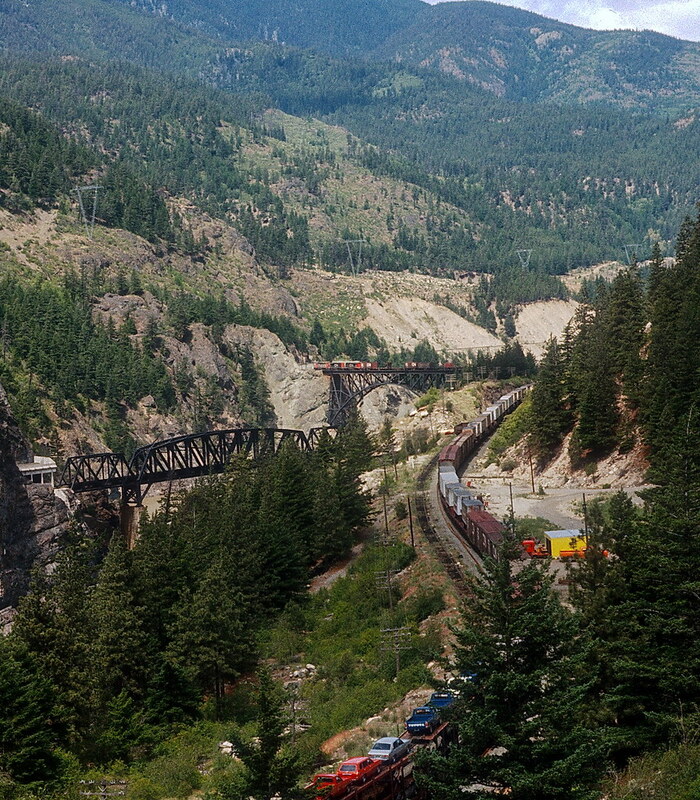 North (east) bound CN freight at Cisco Twin Bridges in the Fraser Canyon - 1 June 1977. 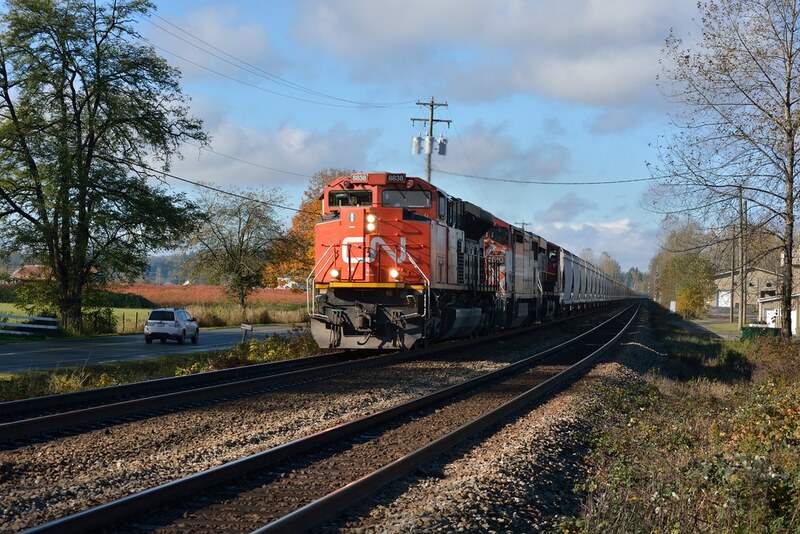 You don't often see east bound trains on the CN track these days, with directional running in effect. 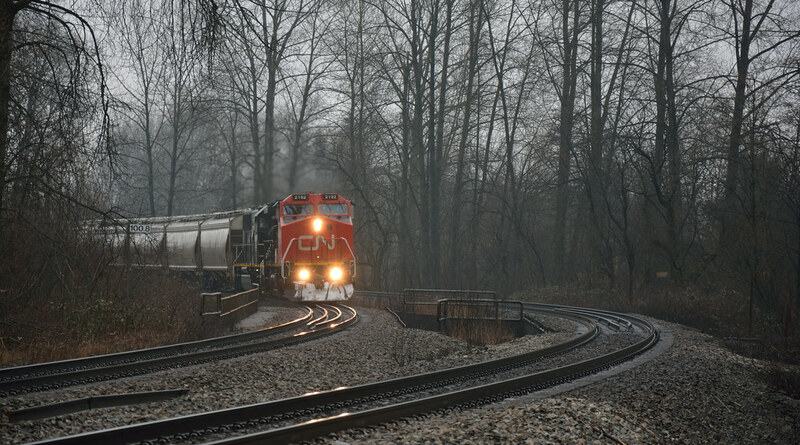 Rainy day freight - South (west) bound CN grain train crossing CN's Cisco bridge - 3 January 2012. You can just make out CP's bridge at the left of the photo. A 39-year range between these two photographs. That's a wonderful long time to enjoy something, and it's not over yet. I think that a long legacy of enjoying something, and sharing it, is a very good thing. For me, I'm a latecomer to this hobby and so I need to remember that what I'm doing is not a new thing. My photos from the roadside berm at Cisco Bridges are not a unique thing. I may have thought it clever to find this spot, but WCK and others found it long before I did. There's something special about "discovering" things that you later realize many other people also discovered. You then realize that it's not about finding something that you think you own (ie. "that's my location), but you realize that you've shared something special with other like-minded good people. I think it's cool that WCK has visited the same spot for rail photos over the past 39 years. And it's cool that I've now visited that same spot, for the same purpose. Similar is how our forum member "Ferryman" recently took a shot of the Queen of Nanaimo from near the Lions Gate Bridge. - He's in the same location where the cameras of Leonard Frank and David Thorne have worked, in years past. I was going to mention that the first CP Cisco bridge is still in use...well, it's still in situ at least. 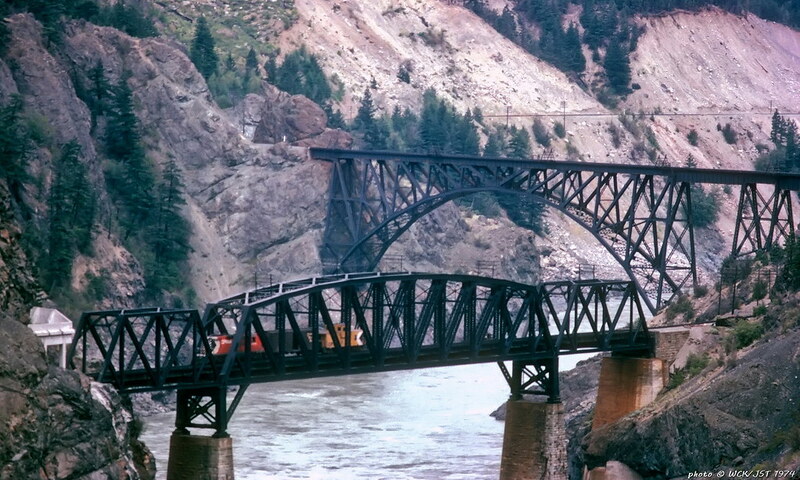 CP's current Cisco bridge has been in service for 105 years (1909 to 2014). The stone pillars & abutments that the current bridge rests on are the same ones used for the original. They date from 1884. You have to wonder if they might need replacing soonish? These photos were taken along CN's Yale Subdivision. I can guess, but if you know, please post about it. Might just have something to do with this? During the spawning months of 1913 the Canadian & British Columbia governments desperately blasted at the debris in the river & managed to save a precious remnant of the run. They had hardly finished the work when, on February 23, 1914, a single slide from a railway tunnel on the east (CN) side of the Gate filled almost half the river channel. This seemed to complete the calamity. 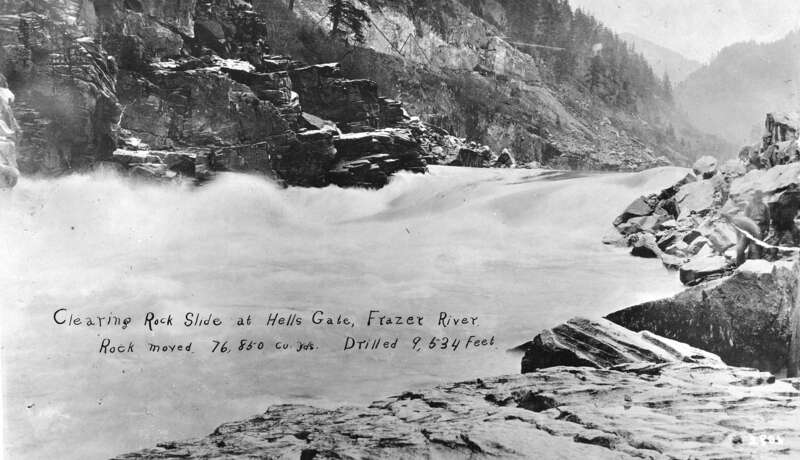 The Fraser River fishery has never really totally recovered from that event, though the construction of the Hell's Gate fishways in the 1940's did much to undo the damage. * For Mr. Horn & others who want to know BC's history, this book, The Fraser, should be on the 'bucket' reading list. Mr. Hutchinson was perhaps BC's best newspaper man & author of the 20th century. 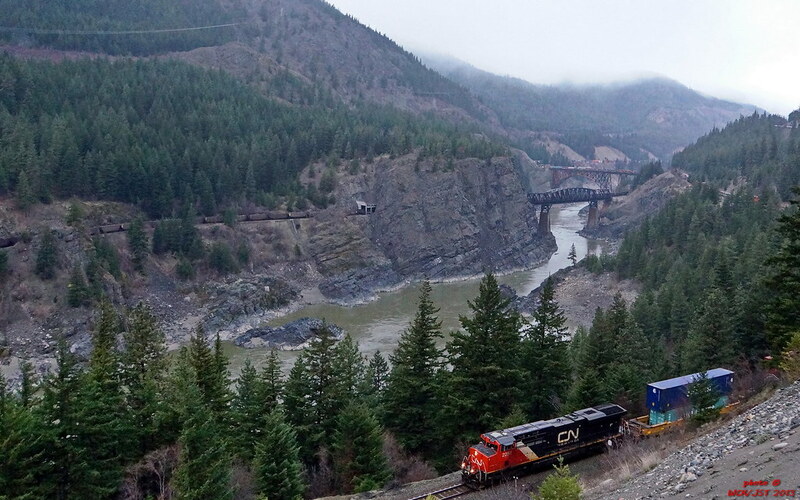 "The rock filled in back-eddies the salmon rested in while getting through the gorge, and narrowed the canyon from 300 feet to 75 feet wide"
CPR transfer moves to and from Vancouver. Both photos taken near Milepost 120, Cascade Subdivision.